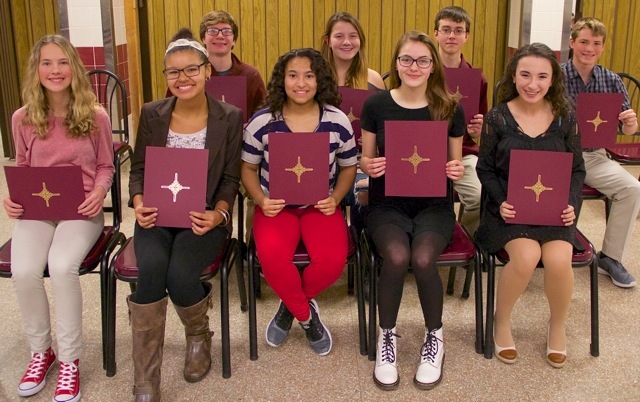 Setting goals, expecting success and working hard to achieve it in the face of setbacks was the sage advice Newark High School math teacher Jennifer Johnson gave students at the annual Academic Excellence Awards Dinner on December 8th, 2016. Johnson, whose maiden name was Damick until she married Stephen Johnson, an electrician, in October, graduated from NHS in 2009 and began teaching at NHS in 2015. 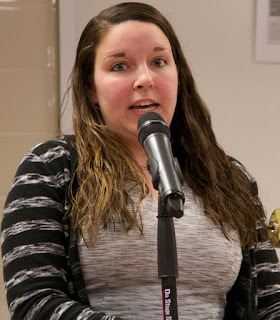 She spoke at the event where grades 10, 11, and 12 students who earned an average of 90 or better during each quarter of the 2015-16 school year were recognized for their outstanding achievement. NHS special education teacher Chelsea DeGroote who coordinated the event commended the math teacher, a Newark native, for setting goals early and not being satisfied until she achieved them. Then Johnson, who earned her bachelor’s degree in mathematics from RIT and her master’s degree in education at SUNY Brockport, commended the students being recognized. “First, I want to say that this night is all about celebrating your success,” Johnson, a second year math teacher and co-coordinator of the NHS Capstone graduation program and freshmen mentor program, Link Crew, told students and their guests in the NHS cafeteria. Explaining she’d been invited to share what she thinks success looks like, Johnson shared keys on how to be successful in and outside of school by providing a snapshot of her own experiences. “I think of myself as a success,” she continued. “ I was successful in High School like all of you. I worked hard to achieve good grades while being a three-sport athlete. I participated in many different clubs in high school and made many friends who I am still very close to today. When I went off to college, I continued to work hard to achieve my goals." “I, like many people, had a few setbacks along the way, but I still consider myself a success. Not only because I got a job right out of college. I set a goal very early on in life on becoming a math teacher, I continued to strive for that goal even when I encountered set backs. I was successful because of the friends and family I had supporting me along the way. I chose to not measure success by just receiving good grades. Success is measured by the lifestyle you choose to live." Johnson then told students to strive for success outside of academics. “It is important to be kind to others,’’ she said. “Be respectful, go above and beyond to help others with their problems. If you can’t help them, just listen when they need you to." “Going beyond the classroom will allow you all to find your own journey in life. It is important for you all to see that you are a product of Newark High School. I am a product of Newark High School and I chose a path to come back here to have an impact on student’s lives. Eight of my best friends graduated with me in 2009. We are all in different parts of the United States, all on a different path, and I believe we are all being successful." Then she asked students if they expect to make mistakes and have setbacks along the way. The math teacher then told students the other important part about creating their path in life is setting goals for themselves. 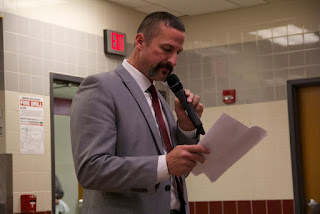 Dinner guests, including Superintendent Matt Cook, Krista Lewis, Assistant Superintendent of Curriculum and Instruction, Jen Singer, NCSD Director of Pupil Services, Board of Education members Susie Earl and Yvonne MacTaggart, other parents and guests affirmed Johnson’s sentiments with hearty applause. 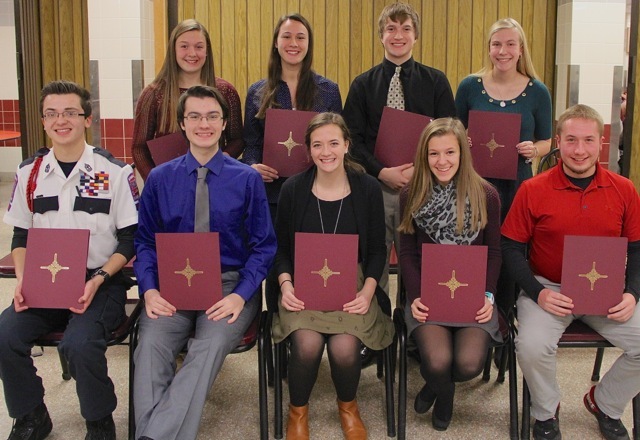 Then NHS principal Tom Roote and Assistant Principal Ryan Wagner presented students with certificates of recognition for their academic achievement. In all, 100 students met the academic requirements for the award, but not all were able to attend. Class of 2107 students recognized included: Ekaterina Barrett, Dylan Bianchi, Nina Bishop, Ryan Blair, Jillian Blodgett, Forrest Blondell, Evelyn Childs, Jackson Correia, Bandon Custer, Tiffany Gilligan, Joseph Goodman, Alexandra House, Amanda Hutteman, Thomas Jensen, Emily Johnson, Shaniah Jones, Jacob Lindberg, Ian MacTaggart, Emma Meeks, Diego Mendoza-Romero, Zechariah Nower, Kassidy Paddock, Emily Reinardt, Lauren Shroo, Brian Sharp, Carly Shear, Kalista Swan, Katherine Thoms and Ryan Velte. Class of 2018 students recognized included: Benjamin Allegretti, Olivia Bailey, Hannah Bates, Kendralee Bell, Landon Berrios, Gregory Bremer, Aleah Buckalew, Bridget Camblin, Alejandro Caraballo, Parker Casselman, Nick Cepulo, Madison Chandler and Benjamin Cowles, Preston Hilfiker, Andrea Hoe, Anna Howell, Michael Hutteman, Grace Kreuser, Elliot Kwaitkowski, Isaiah Lyon, Hannah Mateo, Logan Moynihan, Jacob Napoleon, Angie Otterbein, Nathaniel Payag, Sierra Powers, Megan Rodriguez, Sydney Salone, Emily Schultz, Audrey Smith, Jadan Smith, Ladonia Smith, Nicholas Stalker, Lilie Tang, Ashley Watrous, Mackenzie Westcott, Brianna Wilkie, Amanda Williams and Paige Yon. 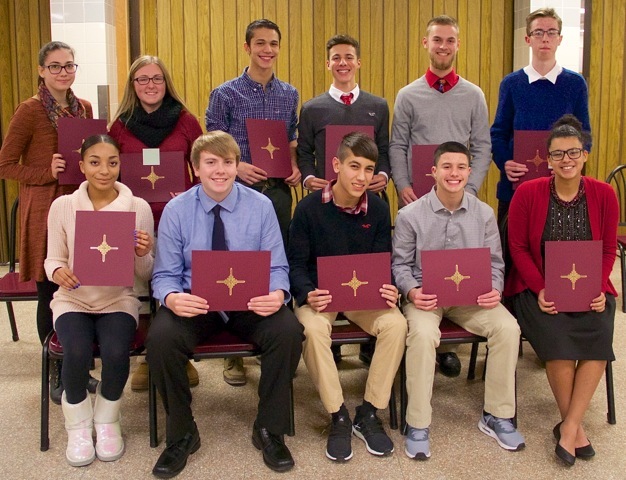 Class of 2019 students recognized included: Natalie Acquista, Abigail Belliveau, Jasmine Bueso, Megan Bullock, Nichelle Camp, Liam Childs, Caitlin Chopan, Alexander Collom, Emma Correia, Anabel Darling, Madison Dillion, Jayden Durfee, Amanda DuVall, Jacqueline Furfaro, Timothy Huber, Bryson LaBerge, Joseph Malachi, Bailey McCormick, Miranda Meyer, Alberto Morales, Emma Perrone, Connor Robbins, Zachary Rodrick, Talissa Rodriquez-Ramos, Colin Steiner, William VanDusen, Medina VanDuyne, Alexandra Ventura, Chloe Weichbrodt, Madeline Wetmore, Mallory Williams and Dylan Wong. After the presentation Roote spoke. A waterfall begins with just a few drops. Tomorrow is a day with no mistakes in it yet. When considering making connections, ask yourself, what can I do to accept others attempts to connect with me and what can I do to get others to accept a connection from me,” continued Roote who then shared a family story to illustrate his point. A highlight of fall at NHS, DeGroote thanked everyone involved in the Academic Excellence Awards Dinner. She also thanked Food Service Supervisor Michele Backus and Warren Bushart, Director of Food Service, for preparing the meals, and parents, Board of Education members and administrators for attending and for “being here tonight to celebrate all of these wonderful and deserving individuals.” She also noted that students who had been recognized for two or more consecutive years at the Academic Excellence Awards dinner also received a winter sports pass that will allow them to attend all winter sporting events for free. 0 Comments to "NHS Holds 2016 Academic Excellence Awards Dinner"